WILL THE MACHINE DO THE JOB? THE PRICE OF THE MACHINE. Repeat of the first important factor outlined above. However, other serious issues that should be discussed are the throughput of the machine in tons per hour and the desired end product size. In simple terms, the throughput and the cut size. From an industrial shredder maker point of view, the list of questions to ask a client can be very extensive. Most Clients ignore these design options and assume that the manufacturer will provide the proper design options on their own. This is far from the truth. You must be told what design options are going to be used. Every one of these factors has to be selected properly in order to maintain a perfect mechanical balance in your machine. If you decide to change the blade overlap or spacer OD or hook height, without revising all the other specs, you can go from an awesome machine to a useless machine. This term refers to the distance between the centre to centre distance of the two shafts or a group of two shafts. In a quad shaft or four shaft machine there are two ways of determining the centre to centre distance of the machine The most simple is to determine the centre to centre distance of all shafts. There are two top shafts in a quad machine, left top shaft and right top shaft , which we often call the top outside shafts of the machine, left top outside shaft and right top outside shaft. There are two bottom shafts in a quad machine, left bottom shaft and right bottom shaft, which we often call the centre shafts of the machine, the centre left and the centre right shafts. What is the centre to centre distance of the left top shaft and the left bottom shaft? What is the centre to centre distance of the left bottom shaft and the right bottom shafts? What is the centre to centre distance of the right bottom shaft and the right top shaft? And, not to forget. What is the centre to centre distance of the left top shaft and the right top shaft? Many groups will only give you the design distance of the left bottom and right bottom shafts. Most groups will only give you the design distance of the left bottom and the right bottom shafts and the left top and the right top shafts. We prefer to have all of the centre to centre distances provided to our client. The first four shaft machine had all shafts on the same plane. Therefore this early four shaft design was basically two shredders side by side and the effect was that there were two shredders as the shaft rotation of the four shafts acted as two separate machines. 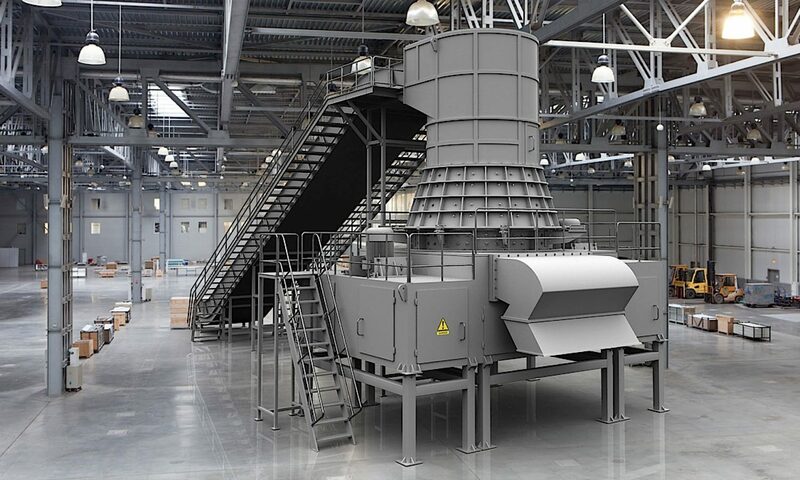 The design of the four shaft machine changed when the two centre shafts were allowed to co-act together for shredding allowing the four shaft – two shredder effect design to become a four shaft – three shredder effect design. The design of the four shaft shredder then went from a simple V design to a wide V design or U design. Regardless of the machine design, if the shredder has two shafts, three shafts or four shafts the concept of a machine design starts with the choice of a centre to centre distance for the shafts. This is the first and most critical piece of data around which the entire machine is designed. Selecting the proper centre to centre distance for machine should be based on both experience and engineering principles. As an example, you cannot expect to shred truck tires in any machine with an 8″ centre to centre shaft design distance, even if you designed the length of the opening to accommodate the diameter of the tire the shredder would choke and stop as the squeeze distance would not allow for the material to travel through the cutters without restrictions. Experts like us will take into account the type of material you will be shredding, your desired throughput tonnage rate of the system and the final particle size desired when selecting the right centre to centre distance on your shredder. But this is not the only issue in the design that we must be concerned with. It is a combination of many design features that make the shredder work and work well for the client. After the centre to centre distance has been properly selected, we can move onto the other design feature, or features. One of these design features of the industrial shredder is the shearing overlap of the blades. This refers to distance the blades will overlap past the centre line between the two shafts. As an example, if a 24″ c to c (centre to centre) distance has been selected, then the middle line or shear line will be in the centre at of the two shafts or 12” from each shaft centre to the middle of the two shafts. If you were to select blades with a 12″ radius or a 24” diameter without any hooks there would be no co-action between the opposing blades and there would be little or no shearing. If you want to effect shearing from the co-acting cutters then there must be an overlap and in the case of industrial shredder designs this overlap must be ½ inch beyond the centre shear line or a cutter that has a shearing radius of 12.5” or a 25 inch diameter. This allows for a ¼” rounding of the cutter edges caused by wear while still ensuring an overlap to effect shearing of materials, although degraded by the rounded edge of the cutter there would still be overlap that would rip and tear the material being shredded in the machinery with worn cutters. This shearing radius of a cutter is once again, dictated by both experience and engineering principles. Some materials require a bigger overlap than others in order to produce the desired shearing effect and the desired end product size. This is a term that most shredder groups or shredder users have never heard of or discussed. Some shredder manufacturers don’t take this design factor into account when they design and build a shredder, but it’s probably the single most important design feature in any shredder. What is the squeeze distance? In short, it’s the void space left between the spacer on one shaft and the cutter hook tip on the opposing shaft. This is why the tip to tip design distance on an industrial shredder is important in respect to the outside diameter of the spacer and the centre to centre distance of the machine. These three items are all related to each other and they determine the squeeze distance of the machine. Hook height and Spacer outside diameter can be changed within each machine to help set a proper squeeze distance. But, this is based on the fact that there is a proper centre to centre distance on the machine being offered. If the centre to centre distance of a machine is not proper then the squeeze distance may not be proper or possible to design in the machine based on its available centre to centre shaft distance. When shredding material, regardless of its composition or nature, the industrial shredder is only cutting the material in the overlap section of the blades or the co-acting edges of the opposing blades. All material being fed into the shredding chamber has to go somewhere, and in a shear shredder it is normally top loaded and bottom discharge. Let’s review truck tire shredding as an example. We know for a fact that when a truck tire if compressed flat by a plate of heavy steel that is it about 4 inches of thick rubber. That means that when you shred this truck tire the cutter hook tip on the cutter has to clear the outside of the opposing spacer by 4 inches. All you have to do is ask any shredder maker what machine has a cutter hook clearance of 4 inches from the opposing spacer. Most shredder groups will not know, or they will have to figure this out and get back with you. Most shredder groups do not have the engineering experience to even discuss these design options. The industry has lost its engineering talent over the last 45 years and our group has taken the time to train our staff in these issues. As outlined above, if a shredder is selected to process truck tires into a rough shred to a fuel chip you need to have a squeeze distance of 4” if possible. This squeeze distance does not occur until you are in an 18 inch, or larger centre to centre design on the machinery. The real design distance of 4” occurs in a 24 inch centre to centre design with the proper shaft size and spacer size and hook size and hook height. Consequently, when shredding truck tires or other thick materials that are bulky and thick, you need a machine that will have a squeeze distance of 4″ or more. If the squeeze distance of the shredder is less than 4″, the machine may reverse more often, and the shafts will be forced to handle large cyclical loading to force the material through smaller centre distances common to smaller machines. The type of material that is to be shredded can often be thicker than the squeeze distance of the shredder such as a bale of paper or a bale of plastic. However you now encounter a bunching problem where the industrial shear shredder grabs a large handful of material and tries to shear and shove this through a small hole created by the squeeze distance and the cutter width. This is created by the centre to centre distance of the shredder and the width of the cutter and the hook that is used to grab the material. There are many issues to address when selecting your shredder. The client may not care how we design a shredder, but if our shredder is not designed properly then it will not work well for the client. 90% of all shredders purchased in the world are not properly sized by the manufacturer, and the client in most cases does not even know that fact. DOES IT SHRED BETTER, IF THE FOLLOWING DESIGN ITEMS ARE USED OR CHANGED? Shredder selection of industrial shredders is not as easy as choosing an office paper shredder at your local office depot store. These are machines that are very expensive to build and very expensive to own and operate. Take heed as most shredder makers are not aware of how they make their shredders Most Shredder makers did not invent their shredder, they copied our shredder. Beware of shredder makers who know nothing about making shredders. Beware of big name shredder makers who know nothing about making shredders. It may be easy to copy a shredder, but it is another thing to make changes to a shredder and know why those changes affect the shredder and its performance.